PanARMENIAN.Net - The two pilots on board a missing army jet which turned out to have crashed in the mountains of Armenia on Tuesday, December 4 have died. Defense Ministry spokesman Artsrun Hovhannisyan identified the crew as Lieutenant Colonel Armen Babayan and Major Movses Manukyan. 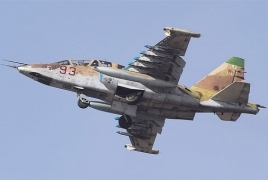 The jet aircraft of the Armenian Armed Forces lost contact with ground officials shortly after taking off from the airport in Gyumri. According to a statement from the Defense Ministry, the plane was carrying out a training flight.